My husband says that I have a one track mind and when it comes to sewing and I definitely agree with him. Earlier in the week I decided that I wanted a new skirt to wear for the weekend, so on Thursday night I did the cutting and Friday night I sewed it up. I bought this fun Michael Miller quilting cotton last weekend at Quiltin Cousins in Pismo Beach, California. 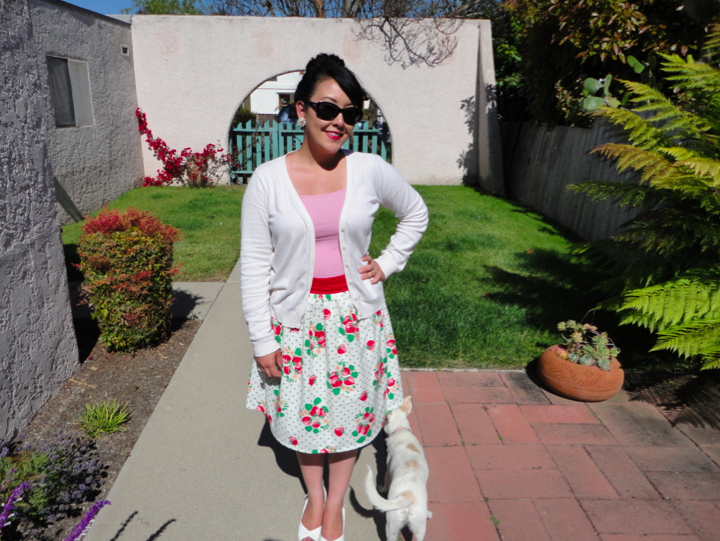 It was almost exactly a year ago when I made this skirt last and the difference in skill is huge! My favorite sewing book turned me on to using three rows of basting stitches instead of two and it makes the gathers look 100 times better. This is the pattern I used. My skirt is View D, but I omitted the pockets. When I made this last year the skirt took me forever (it seemed) to sew up and I wasn't 100% happy with how it turned out. 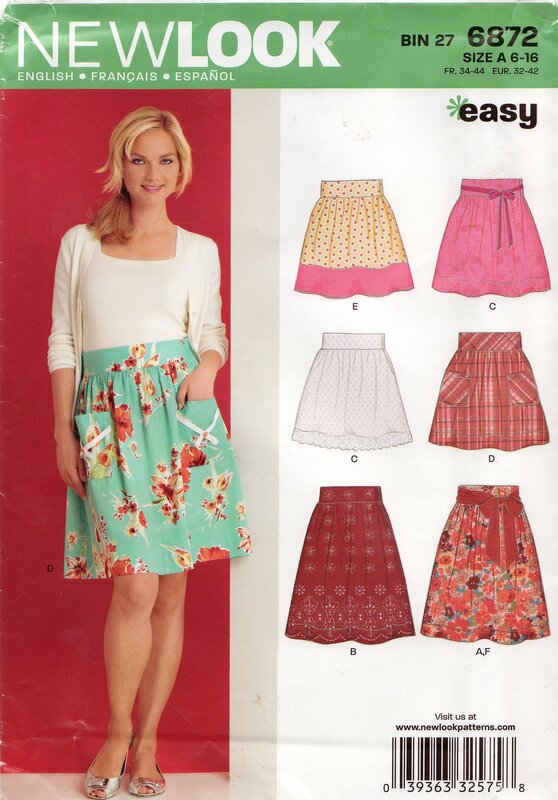 Have you ever revisited a sewing pattern that you used when you first started sewing? Wah!! I LOVE this skirt!! It looks so fantastic on you and that fabric?! Utterly awesome!! 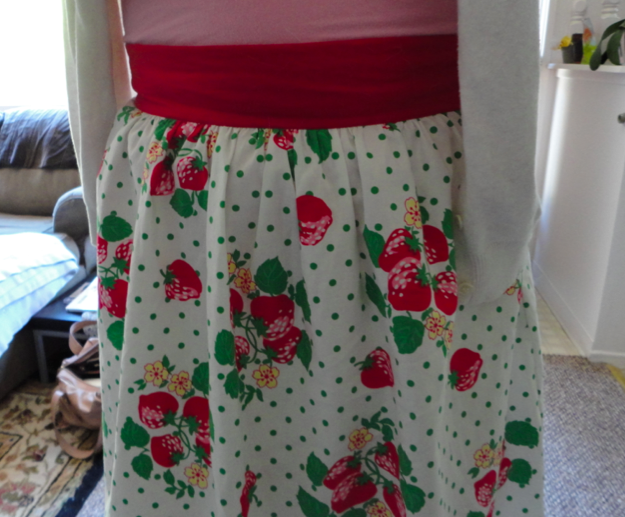 I love strawberry and cherry print fabrics! I love that you've paired it with a pretty pink top. Yay, Erin! You look so summery, and it's so exciting! I don't know about "revisiting" a pattern per se...but there are definitely a handful of patterns I've made repeatedly over the course of my sewinglife, and I can totally tell, both in the sewing experience and by looking at the final product, how much my skill level has changed over time. what a cute skirt!! and what cute fabric!! oh my god it looks just like some strawberry shortcake sheets i had as a little girl - I LOVE IT!! I haven't revisited any patterns, but after MMM, I really want to remake the first dress I made! Now that I know about proper finishing techniques, I can make a version that might actually last! LOVE IT. I do and what a big difference experience makes. I was looking at my lasts make thinking wow.. i have really improved. I think we all go through this process but it take a simple item to realise it. Great skirt!! And Michael Miller fabric too. Love, love. I have this pattern and am planning on making one of these views in the next week, so perfect timing. Thanks for the three rows of basting stitches tip. I ordered a Colette book but don't have it yet so this definitely helps. Thanks for the help and the cuteness. Cute and so well done! Yes, I have revisited patterns and I am amazed at how much more meticulous I am. It's such a fun hobby! It's lovely! I find that I do want revisit patterns more and more. I always want to make more versions but you know what it's like with the never ending sewing list, never enough time! so I have but not as often as I would like. really cute skirt Erin!! Hmmm... I don't think I've reused any patterns other than sorbetto :) But it's high time that I did!! I have a couple dress patterns and a blouse pattern that deserve to be reused. I think my problem is that I'm always itching to try something new. But the prospect of not having to cut out a new pattern is delightful! What a sweet little skirt!